iPhone offers a lot more than elegant design and durability. That’s the reason iPhone is one of most desirable smartphone on its shelves. Apart from the most powerful and smartest software, it offers almost everything that a user wants to have in a phone. However, after the launch of iPhone 6, 6 Plus a few users have reported that apps on iPhone keep crashing. In this post, we’re going to list some of the ways that you can use to fix apps crashing on your iPhone. So, here we go! Apps crashing can be very irritating, so try out these basic yet effective methods to resolve this issue. Rebooting your device resolves most of the minor issues that your smartphone is facing and sometimes it is also capable of fixing the iPhone apps crashing issues. Moreover, it is a straightforward way that doesn’t take much of your time. All you need to do is just hold down the power button till the time you don’t see the Slide to Power Off prompt appear on the screen. Make sure you slide the red power icon from left to right to turn it off. Before restarting your iPhone, you need to wait for at latest 30 seconds. Make sure you don’t restart your device before it shuts down all the way off otherwise you might not get the desired results. You can use various ways to clear up junk files, cookies, and cache. However, removing and eliminating unnecessary data from the iPhone not only frees up the memory but is also useful in fixing iPhone apps crashing issue. Follow the below steps to do the same. Step 2: Click on Safari. Step 3: Choose Clear History And Website Data. Step 4: Now, once again click on Clear History and Data to get rid of cookies and cache. Performing these steps on your iPhone will make your device work faster than before. Moreover, this is one of the quickest and helpful ways that will help you to get rid of the unwanted data and also help your apps to work properly on a device that automatically reduces the iPhone apps crashing issue. There are the possibilities that outdated apps might create an issue in the device like crashing. However, keeping your device and apps up-to-date not only enhances the performance of your device but also fixes the basic issue that you’re facing with your iPhone. Updating your apps hardly takes much time of your busy schedule and works amazingly for smoother iPhone experience. Step 1: Firstly, launch App Store app on your iPhone. Step 2: Click on Update button that is available at the right-hand side corner. Step 3: Choose Update All from the top right corner of your iPhone screen. Having the up-to-date iPhone not only offers a lot of new features but is also capable of fixing minor bugs. It provides a smooth and quick response to your commands. Moreover, using the outdated version may cause iPhone app crashing. In order to update your iPhone, follow the below steps. Step 2: Click on General. Step 3: Choose the second option, Software Update. Your device will let you know if your software is up-to-date. 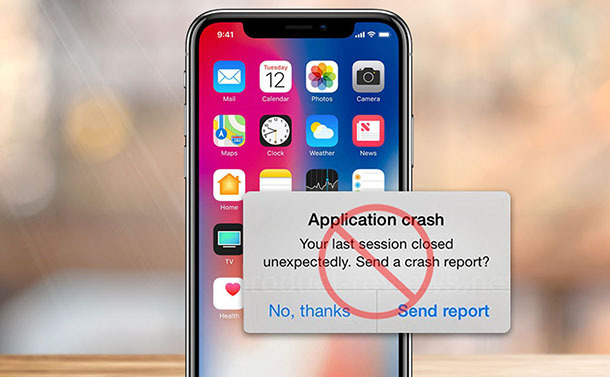 If you’re facing issues with iPhone apps keep crashing, then deleting and reinstalling the app could solve the problem for you. Moreover, deleting and reinstalling the app will clear up the cookies and cache from your iPhone and also recover memory on your device. Step 1: Go to your iPhone’s Home screen. Step 2: Tap and hold the app icon that you would like to reinstall until it starts shaking. Step 3: Click on ‘x’ icon that is displayed on the app. After deleting the crashing app, all you need to do is, open the App Store > type the name of the app in the search bar to get it back. Once you see the app, you need to click on “Get”, followed by the onscreen instructions to have it back on your device. Factory resetting has the potential to solve the issue that is troubling you all of sudden. These issues could occur due to some technical glitch, setting issues or when your device is infected with any malware or virus. However, you can give a shot at factory reset when your iPhone apps are crashing. However, like other methods, this method also doesn’t provide any assurance that it is going fix the issue but there is no harm in trying this out. Don’t you think? Note: Please keep in mind after factory reset you will end up losing your data so don’t forget to take the back up before getting onboard with factory resetting. So, these are some of the ways that you can consider and capable of fixing your iPhone apps crashing issue. However, factory reset is the last resort, you can try the other methods first and in case if none of the above methods work you can go for factory reset or visit nearest Apple store. Ethics: Tech Companies Pay Attention! Do You Know About The Smart Annotation On iPad?